Awhile back I did a Hobbit ocarina review which was a big hit with my husband and children who love playing music on this creative instrument. Therefore, I knew that they would love collection of Marvel Superhero ocarinas available at STL Ocarina! 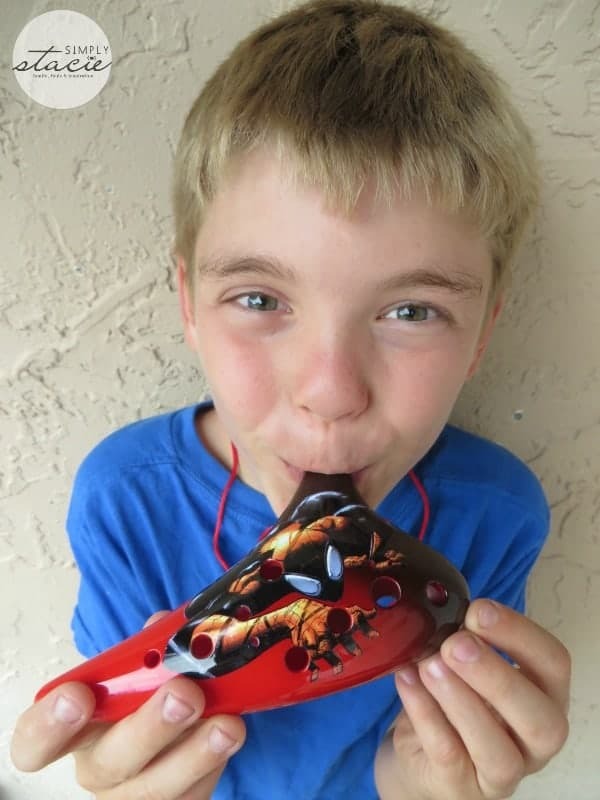 Featuring favorite Marvel Superheros such as Thor, Captain America, Wolverine, Spider-Man and Iron Man this series of musical ocarinas is a great way for comic book fans to learn how to play this fun instrument. The Marvel Superhero ocarina collection is officially licensed and designed by Marvel with excellent graphics that really capture the essence of these superheroes in action. Unlike our Hobbit ocarina these ocarinas are made of plastic which makes it very attractively priced and quite durable. 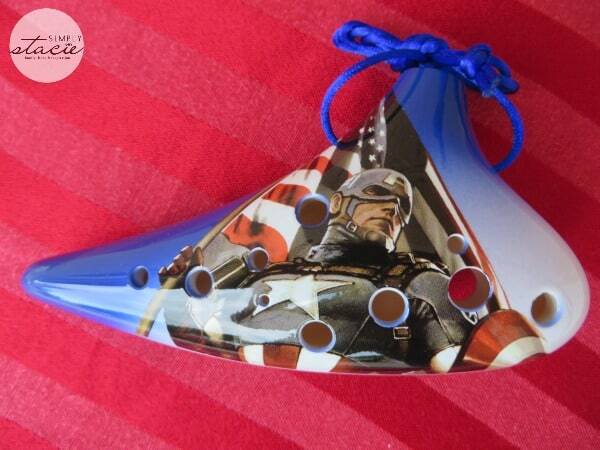 I was very surprised when the Captain America Ocarina and Spider-Man Ocarina arrived because the design is exceptional and it was excellent quality which didn’t look or feel like plastic at all. In fact, for my six and nine year old boys who want to play these, I prefer it to be this type of plastic because I am not as worried that it will get broken if accidently dropped. I love that each Ocarina comes with a free online instructional booklet which I was able to access while teaching my sons to play their first songs. The neck strap helps to conveniently keep the ocarina securely in place with less chance of being dropped between playing songs. It has surprising range with pitch from A4 to F6 including sharps and flats. It was a great bonding experience as my husband spent time with the boys teaching them how to play the basic notes and they really enjoyed doing it. I homeschool my children so we incorporated the ocarinas into our music class time and it is usually the first instrument that the kids request to play. I like it because the sound is very pleasant even if the kids miss the note……i.e. it isn’t hard on grown-up ears which is a big bonus in my opinion. 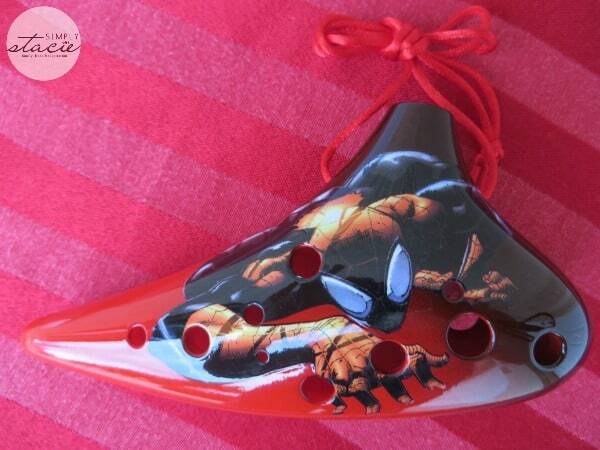 The Marvel Superhero Ocarinas would make a wonderful gift idea for music and comic book fans. It is great for adults and kids alike and is a lot of fun to play. These ocarinas retail for $29.99 but are currently on sale for only $27.49 at STL Ocarina….a great deal! Connect with STL Ocarina on Facebook and Twitter. Oh man my son would have tons of fun with these!! Love that they are made of a hard plastic and not easy to break, that’s a great feature! My daughter would adore these how pretty they are! Given how clumsy she is it’s fantastic that they are durable. When I first saw this post I had to go online and do some research to find out just exactly what an ocarina is. I found a website that sells ocarinas of different shapes and sizes with different designs, so now I understand having a collection of Marvel Superhero ocarinas. This would be great for someone who collects ocarinas, thank you for sharing this review. I haven’t heard about this instrument before but My kids would love this instrument. I had never heard of Ocarina’s before but looks like a fun way to keep the kids amused over the summer. OMG that is soooo cool. Big Marvel fan over here. Oddly though,, I have never heard of an Ocarina before.